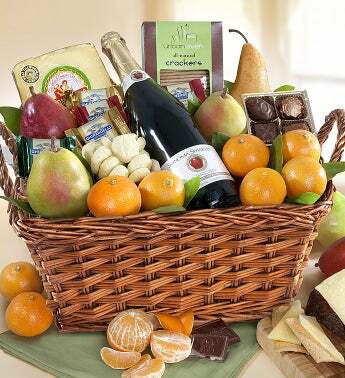 From some of the most beautiful, fertile lands along California’s Northern River Deltas, comes this elegant gourmet gift basket that’s filled with Satsuma Mandarin Oranges, Romanello® Cheese, Urban Oven® Olive Oil Crackers, Filled Chocolates and much more. It’s exactly what you’d expect from orchards that, like great friendships, are so carefully tended and cultivated. They’ll adore it – and you! Arrives orchard-fresh, ripe, and ready to eat! Shortbread Cookies and much more! After the fare is finished, save the basket for the linen closet – it’s an ideal organizer for pillowcases, towels, etc. Weighs an impressive 10lbs 12oz! From some of the most beautiful, fertile lands along California's Northern River Deltas, comes this elegant gourmet gift basket.